The synopsis compares this to Divergent and Hunger Games, but this sounds more high fantasy to me. Either way, it sounds exciting. Have you seen the anime Blood+? The blood idea reminded me of that. In any case, yeah, I thought it sounded more like a high fantasy novel, too. Maybe it's a high fantasy with dystopian elements? Super excited for this. The cover is gorgeoussss. Already read it! It's amazing! Saw this book on Netgalley and got curious right away, that cover is so cool. Usually I don't read books from the fantasy/dystopian genre but this sound pretty good. Sounds interesting - and that is a rather striking cover. OH, YES!! It's SO good! I really like the cover -- very eye catching. 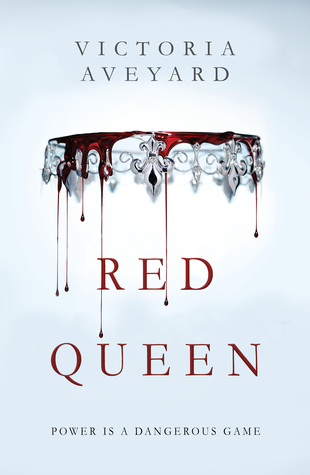 Red Queen sounds interesting, I'll have to keep it in mind. I have heard nothing but good things about this book! I can't wait to read it, either! Starting to think I need to read this one as well! Sounds delightful! Heehee! I'm also waiting on this one. The cover, the synopsis, everything! I need this book in my life YESTERDAY! Great choice! I cannot wait to read this! I need it!! This book makes me want to squee with excitement, lol! I'm really just dying to get my hands on it, and have no idea how I'm going to wait till next year to read it! Excellent pick!! So luck to come across your excellent blog. Keep up the good work.